In case you want to try your own, here’s the recipe for sourdough starter and bread. It’s Sally Fallon’s recipe from “Nourishing Traditions” – I so highly recommend that cookbook! You need: rye flour (8 cups), cold filtered water (about 8 cups), cheesecloth, and two gallon-sized bowls. This recipe makes 3 quarts of starter. 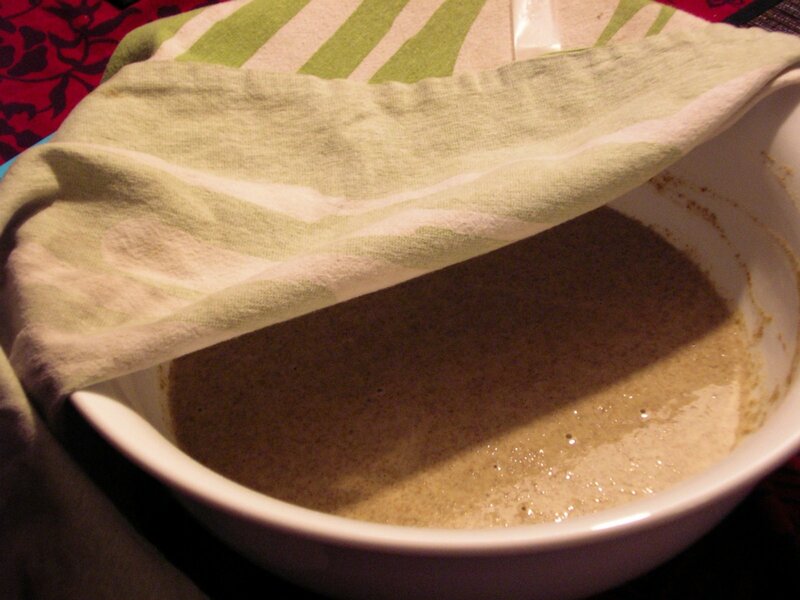 Mix 2 cups rye flour and 2 cups cold filtered water in a gallon-sized bowl. Cover with cheesecloth tightly secured with a rubber band. I put a tea towel over mine, and taped it down…hope the fabric is loose enough to let the bacteria and yeast in! Place the bowl in a warm place in your kitchen or, if you live in an unpolluted area, you can try it outside although I think you want to keep it kind of warm so winter might not be the best time to do that. I’m keeping mine on top of the stove. Every day for a week, move the starter to the other clean bowl and add 1 cup rye flour and about 1 cup cold filtered water (enough to make it soupy). Cover it up again and let it sit. By about day 3 you’ll have a bubbly, frothy soup. This is a good thing. By the end of the week you’ll have 3 quarts of starter – 2 quarts for baking bread, and 1 quart to make another batch of starter (add a cuppa flour and a cuppa water each day for a week to get another 3 quarts). If you don’t want to use it right away, refrigerate it. When you are ready to bake bread, use 2 quarts of starter and mix with 2 1/2 Tbsp coarse sea salt and about 1 1/2 cups cold filtered water. Mix it up, then add flour to the tune of about 13 cups. Sally Fallon says spelt flour is best, but I bet any flour you like will be fine. She also says the dough will be sort of soft and easy to work. After the dough is mixed and kneaded for about 15 minutes, set it in loaf pans (3 big or 6 small) or shape them on a baking sheet, cut the top, cover and let rise for 4-12 hours (depends on the temperature in your kitchen). Bake at 350 degrees for about an hour. Voila! Hi Maggie,Got in from your comment on my post. I love the way you write. Nice blog! I have read somwhere that, if the starter smells like something has gone rotten, it is better to throw it away. It is supposed to smell very sour, but not bad. Again, I have always used all-purpose flour – never rye. Not sure if that makes a difference. Hope this helps.BTW, as long as you acknowledge, there is no problem in posting someone else’s recipe. We do it all the time:)Wecome and good luck! I just finally got some rye flour from a “health food” store that sells bulk [does that make the super-sized carry everything store a NON health food store? … but I digress…] What I can’t find is WHY rye is supposed to be good? Does it contain more natural yeast? Also: your recipe seems huge. I started regular and whole wheat starters with just a cup of flour and a cup of warm water and let it sit. Each day toss 1/2 the old starter and add 1/2 cup each flour and water. Then I have starter to use for a batch of bread. http://www.exploratorium.edu/cooking/bread/recipe-sourdough.htmlThe above uses an even smaller amount of flour and makes it stiffer like a biga.Here’s another link I liked: http://www.io.com/~sjohn/sour.htm And finally a video site: http://www.breadtopia.com/sourdough-no-knead-method/ Breadtopia.com has lots of good stuff. The Exploratorium link has a section on using organic grapes to make starter because their skins have a lot of natural yeast… as in… why wine ferments. Sorry that the end of the links seem to have been cut off. If your are using blogs you can probably work around it. Just use the first part of the link and then explore.